My husband likes to build things. He likes building with wood, metal, and even fiberglass. Though he is particularly obsessed with modes of transportation. I've spent many dinners listening to him talk about building cars, planes, boats, bikes, surf boards, you name it, he plans to make one one day. I have no doubt that we must eventually retire to land to build a workshop. Maybe a tree house for us too. But a fabrications shop is in our future. To say AJ is a bicycle enthusiast would be putting it mildly. Aside from loving to ride them, he knows everything about their history and who manufactured what part when. As he does with any topic that interests him. Talking to him can sometimes be a bit like talking to an encyclopedia, or listening to a lecture on the history of machining. He must know how things work, and he likes sharing this pertinent information. His passion for bikes began in childhood. He took to trials riding at age 13 after seeing the stunts on a friends VHS tape. By 16 he was the Jr. national champion. This speaks to his personality. The personality that makes me trust him so implicitly as a partner on this journey. He believes he can do anything. Or to put it less egotistically, he believes anything that anything that can be done, well, can be done. After trials he took to triathlons and eventually running ultra-marathons. He got a tattoo on the back of his leg to commemorate his first 50 mile run. During his deployment to Afghanistan he kept running, organized runs and ran marathons, and no one was happy when he lead PT. But back to bikes. He has always commuted by bike whenever possible, no matter how many burritos got thrown at him. He worked as a bike mechanic in college, and within a year of moving to Germany we had 10 bikes in our garage. Our Diesel Smart Car (the only motorized wheels we had) was parked in a little space out front in order to allow his road bike, his mountain bike, his touring bike, his trials bike, my bike, and a plethora of lovely vintage local rescue bikes he'd brought back to life to occupy the protected garage. These little restoration projects finally pushed him to do something he had always wanted to do but never afforded himself the tools for. He wanted to build a bike. His sketch book was full of plans, drafts, and measurements. He'd been designing them for years. So he finally bought himself a torch, built a jig and began trying to figure out how to rent an oxygen tank in Germany. (We were stationed in Schweinfurt Germany, from 2008 - 2011). Schweinfurt is an industrial center. Home to FAG Bearings, SKF Bearings, ZF Marine and Industrial Transmissions, Sachs scooters and small motors, and SRAM Bicycle Components to name a few. Schweinfurt is also one of the largest bicycle manufacturing cities in Europe. So it would seem we were in the perfect place to find what he needed. We braved the German internet searching for types of business that would rent one. A search for welding supply stores (Schweißen Versorgung) eventually proved successful. His first visit to the little tucked away shop though, was unsuccessful. His conversational German lacked key terms like 'oxygen tank'. It turned out no one in the skilled labor industries speaks English. Any English. They couldn't figure out what he wanted. This was only surprising because thus far everyone we had encountered spoke English so well they didn't want to waste time letting you fumble through German. The waitresses, gas station clerks, the bureaucrats, any random person you stop on the street.. So AJ went home and endeavored to find the proper German terms for what he needed. He went back asking for a Sauerstoffflasche. To which they replied "Ja, ja, mieten oder kaufen?" These words he knew, rent or buy. Success. I'd like to pause for a moment to revel in the German term for oxygen. SaurStoff. Sour stuff. The stuff that makes things sour. They have a lot of great words. AJ built a solid vocab of random German industrial/manufacturing terms running around to these different shops. For his first bike he decided he didn't want to waste steel on a full frame if his first brazing venture didn't prove worthy. So he joined this fear with his new found interest in wooden bikes. 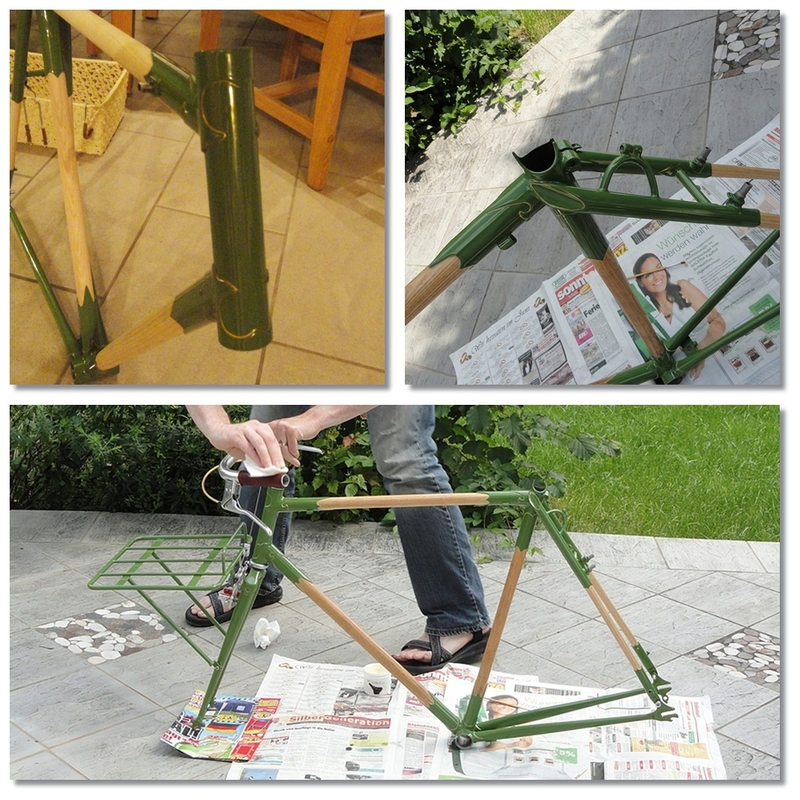 He made a steel lugged, wooden framed bicycle. This allowed him to do all the complex work on the joints, without wasting a tube and lug if the alignment was off. 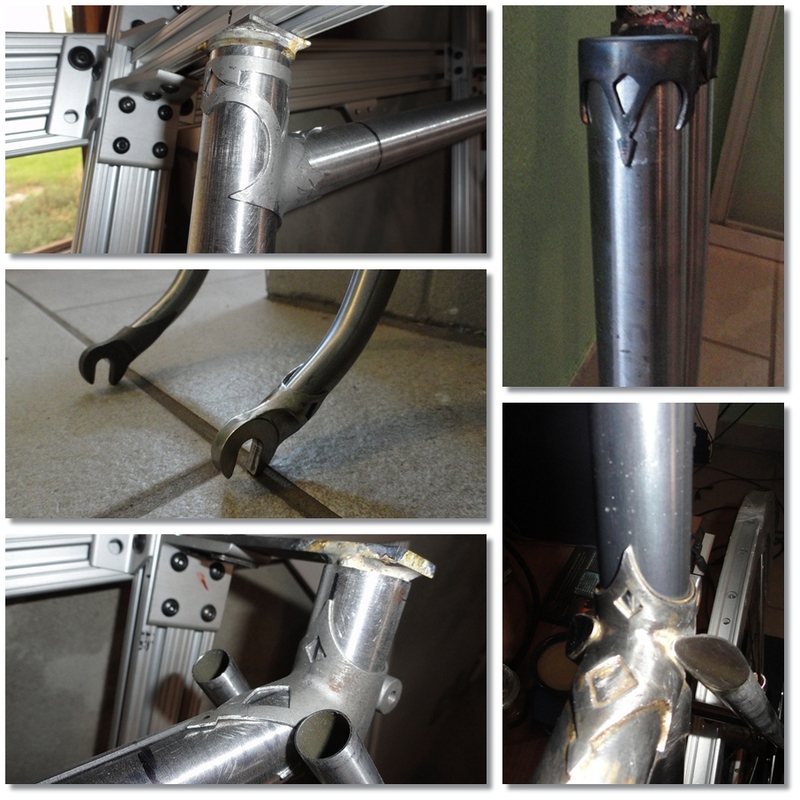 He brazed on shorter pieces of 4130 steel aircraft tubing for mounting the parts and cable routing. He cut and hand filed the steel tubes into shape. And he added rear dropouts with an integrated bottle opener. The steel was powder coated... Pulverbeschichtung. And I did the gold pin-striping around the lugs at his request. 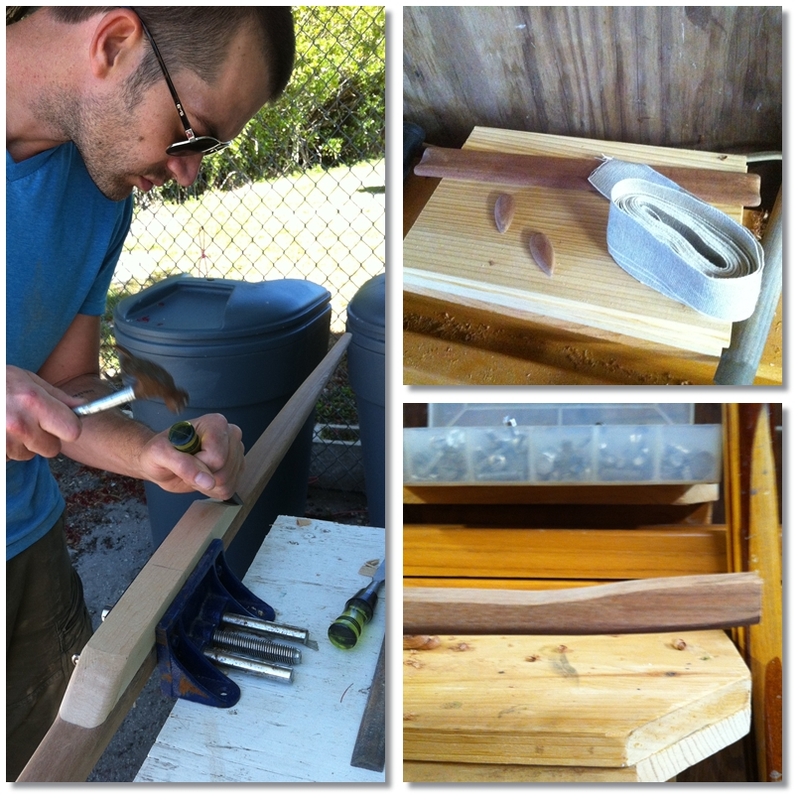 The tips of the Ash wood rods were coated in high shear industrial epoxy and worked into the metal frame bits. The alignment was not off. Brakes: 1960's Mafac Racers Center pull U-break. They were all the rage on the French bikes of the 50's and 60's. AJ brazed brake mounts on the frame to fit them. Shifter and Derailleur: 1980's 7 speed Shimano 600 "Arabesque" - the model line with cast Victorian scroll work. Crank Set: 1970's Campagnolo Record. The top end Italian road bike race cranks of the 1960's and 1970's. Wheels: Campagnolo Record high flange hubs laced to skinny French style Sun ME14 rims. It took a while to find the rims, and even longer to find the tires in the right size in cream-colored rubber. Fenders: Tanaka traditional stainless fenders, still hand-rolled by Japanese craftsman. 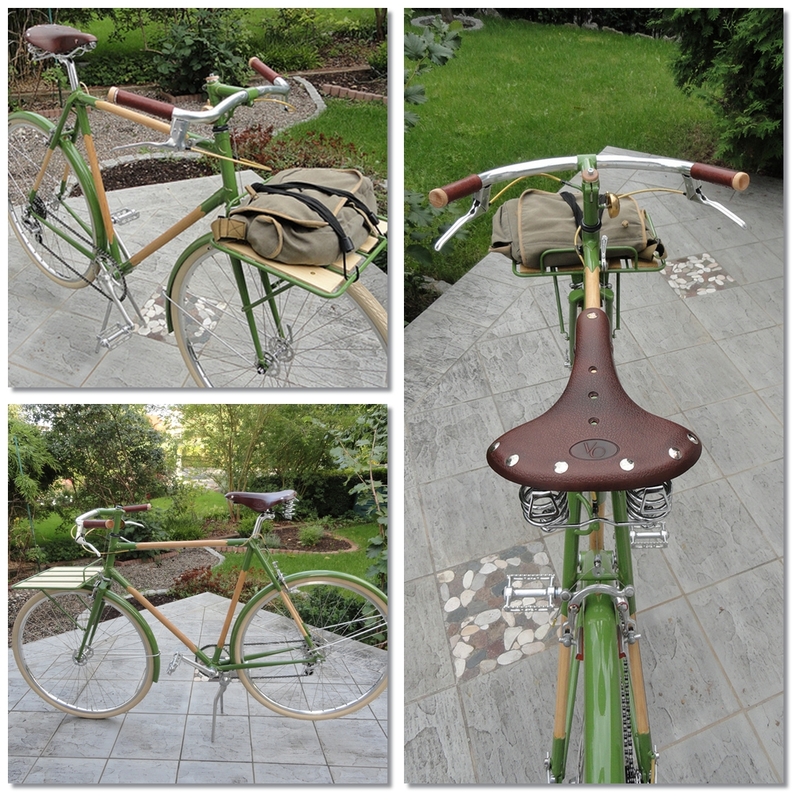 Saddle: Copper-riveted stretched-leather sprung saddle. Grips: Cotton ribbon and shellac wrapped in elk hide, hand finished with a baseball stitch. The touches: brass spring bell on the stem, Swiss Pletcher double kickstand to keep the bike upright and the rack level when parked, 1970's vintage mustache handlebars with integrated brake levers salvaged from another restoration project on the side of the road, brass braided brake cable housings, etc, etc. 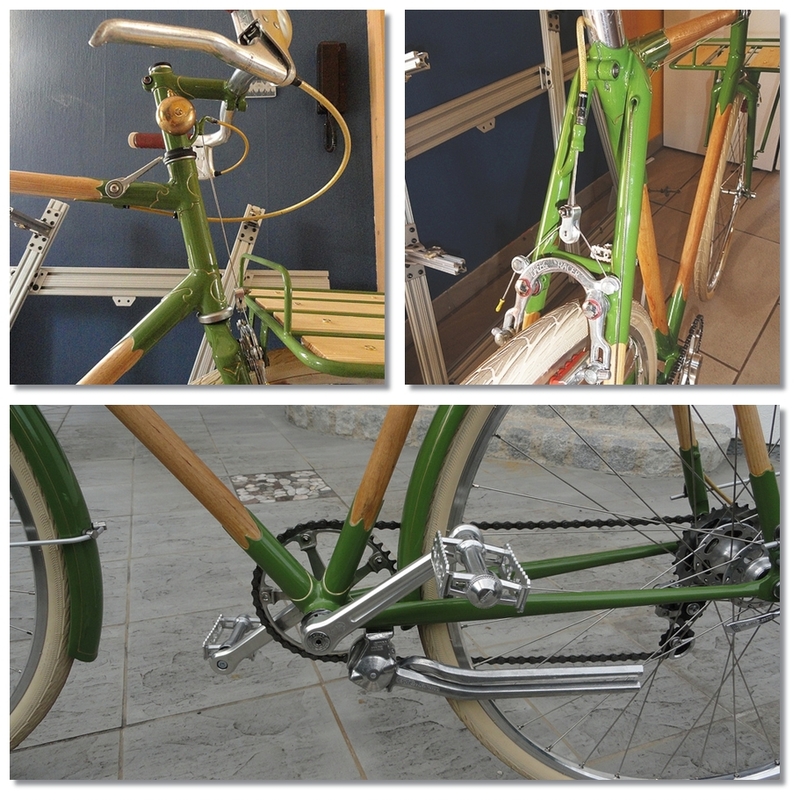 This beautiful functional art bike needs a new owner! It surely can't go out to sea. Isn't Germany adorable! AJ is in front of our neighbors house across the street. He restored Vespas in his spare time. His little daughter wrote "Welcome Family Lea to your new home" in chalk on our driveway when we moved in. She was learning English in school. She got a kick out of our last name being the same as her first name - Lea. Only hers is pronounced like the Star Wars princess. AJ rode this bike on all the sunny days during his year of non-stop bicycle commuting (that included two Bavarian winters!) and took home many loads of groceries. 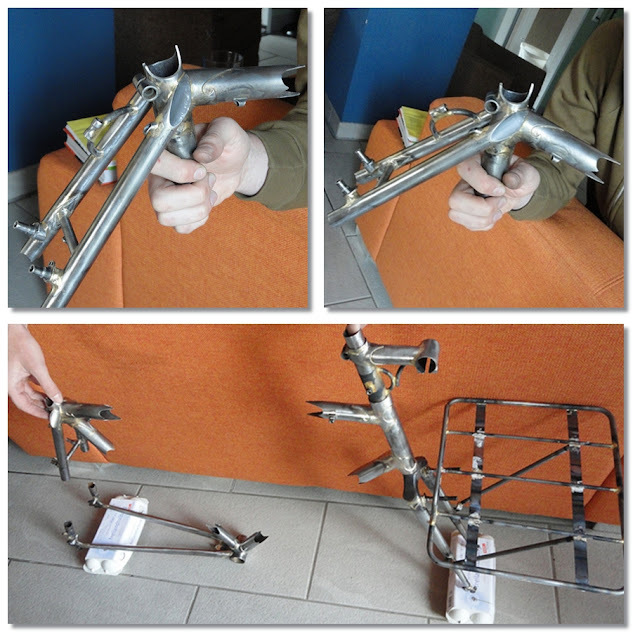 After the success and confidence boost of the first bike he was ready to build a full steel framed lugged commuter bike. He made this one for this father. He used the same Pacenti Artisian cast lugs as on the wooden bike, but he hand-filed them into vastly different shapes. It used traditional french city bicycle geometry. His father chose the color, and has been riding it for two years now. AJ branded his 2 bike run, Dapper Cycles. There are more pictures of bike building on AJ's Flickr. 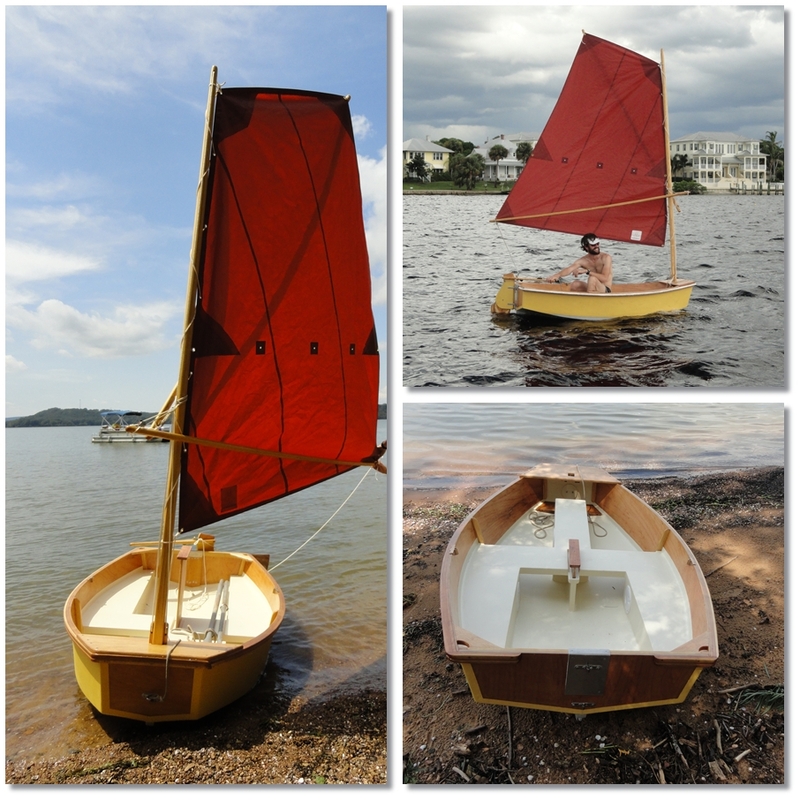 When the time to get a sailboat drew near, he wanted to build our own dinghy. He already had plans to 4 or 5. He's had them for years. But he settled on Jim Michalak's Vole, with his own modifications. In the summer of 2011, we went Back to Arkansas to Build the Dinghy at his fathers house. AJ has been aching for a building project (that isn't the boat) for a couple years. He spends his nights online reading about building whatever interests him at the moment and sketching. (Right now he's reading about a guy who built his own one man submarine). He's going to make me one next. Not a long bow though, something more like a Hungarian horse bow. Possibly out of fiberglass sail battens. I've wanted a bow and arrows since I was a kid. I was exposed to archery in P.E. in middle school, and loved it. Unfortunately they only did it for a couple months, and I never found another venue. AJ has recently become quite interested in lutherie, and wants to make a ukulele. He doesn't really listen to music. And he can't play instruments. (There is something he's not good at!) But I have no doubt he can make a fine one. Then I'll learn how to play the ukulele. AJ is one amazing and talented guy and you are an amazing and talented writer! I can't wait to hear you play the ukulele - you have latent musical talent! The wooden bike - AMAZING! I'd buy it in a heartbeat if I, too, didn't live on a boat. Man! Beautiful bikes! Awesome lugs on those too! I assume a high quality Columbus tubing was used? Or does Germany have its own lightweight tubing?